The value of a media asset management (MAM) system cannot be understated. The MAM system serves as the window into your archive, and a properly implemented MAM system can mean the difference between finding and repurposing assets or letting them sit idle and unmonetized. There are several choices for MAMs available today to suit a range of preferences based on budgets, scalability, and ease of implementation. The systems can be expensive and therefore represent a large financial investment. Whats more, integrating a MAM into various workflow pipelines can take time and additional expense for setup and optimization. With that in mind, adding, refining, or extending functionality depends on plug-ins and other API driven software appliances. A well-designed MAM would be built to allow easy third-party integration. By the same token, third-party applications must be designed to integrate easily as well, and this can only happen when manufacturers work together to find innovative and collaborative solutions. Even after youve put the right MAM system in place, it is only as good as the metadata that goes into it, because that metadata is what makes your content searchable. Assets usually get ingested into a MAM system with basic information such as filename, file type, date, timecode, and duration information. It might also include ratings, descriptions, or relevant keywords. To be more easily searchable, its important to add metadata that describes the actual content within a given media file, but because that data usually must be entered manually through a laborious logging process, many organizations cant keep up, and so their archives lack a useful level of detail. Without extensive logging, captions, or transcription, all of which are expensive, the MAM is unable to effectively search beyond the file-level metadata. In many cases, the spoken word content will best define the meaning of the content. Nexidia Dialogue Search was designed to search media libraries in the absence of metadata and, more importantly, to integrate easily with a MAM system via Nexidias APIs. This integration makes it possible for the MAM to search through a massive media library in seconds based not on the metadata, but on the individual sounds, called phonemes, that make up the spoken words. By analyzing phonemes instead of words, Nexidias patented technology is far more accurate than speech-to-text methods. It easily finds proper names or slang, is not thrown off by individual accents, and is more robust in searching noisy content. Dialogue Search supports dozens of languages and dialects. This capability increases monetization of media assets, improves turnaround times, increases accessibility for all users, maximizes the efficiency of the MAM, and decreases overall costs. In essence, integration with Nexidias APIs protects your investment in the MAM system by expanding its functionality and making it work smarter. Using Nexidia APIs, Dialogue Search is directly integrated with a number of popular MAM systems, including IPV Curator, Vizrt MAM Enterprise Solution, Dalet Media Life, Square Box CatDV, and soon, Avid Interplay MAM. Dialogue Search automatically accesses the media files and metadata stored in those systems. It also enables the export of search results as time-coded markers to those systems as well as into video-editing applications. When used with IPV Curator, for example, Dialogue Search results are directly integrated into the IPV Curator search experience, giving IPV users a new search method using words and phrases on top of their traditional search of logged metadata, enhancing the users ability to discover and reuse assets. 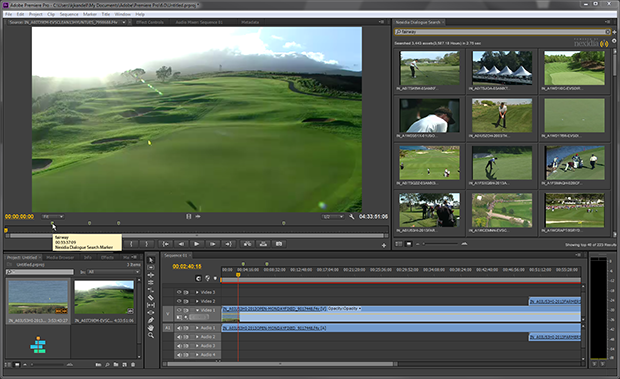 Beyond compatibility with multiple MAM systems, Nexidia has also collaborated with Adobe on an extension that ensures seamless integration with Adobe Premiere Pro. This collaboration means that Adobe Premiere Pro users can leverage all of Dialogue Searchs functionality directly from Adobe Premiere Pros interface without having to leave the application. Simply by adding the Nexidia Dialogue Search extension panel to their workspaces, users can preview search results in a video player without having to scroll through numerous clips to find a specific sound bite or clip. 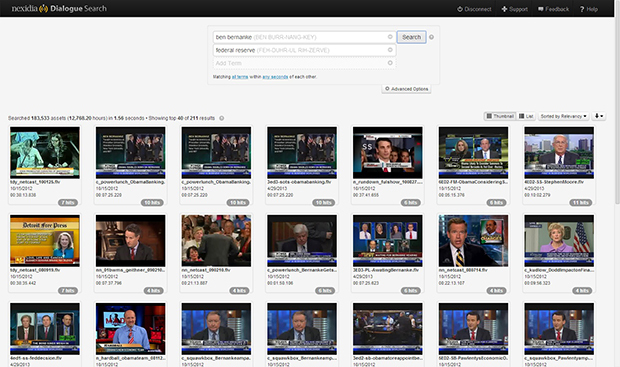 The fact that Dialogue Search easily accommodates so many different MAM systems, is portable across different MAMs, and is able to connect to multiple MAMs, makes it especially valuable to multisite broadcasters and others who have adopted a mix-and-match approach, whereby they use different systems in different places depending on the creative need but still need to make sure they all work together. None of these integrations and their resulting benefits would be possible without a commitment to collaborative design. In other words, when manufactures make sure their products can play well together, as Nexidia has done with its partners, everyone wins.